With in the initial 3000 hours of operation, the higher initial investment made in Case III in comparison to Case I will get recovered and later on one can easily identify from the graph the kind of savings one will realize. Case III compared to Case II will recover the extra initial cost incurred with in initial 14000 hours of operation and will fetch savings afterwards. 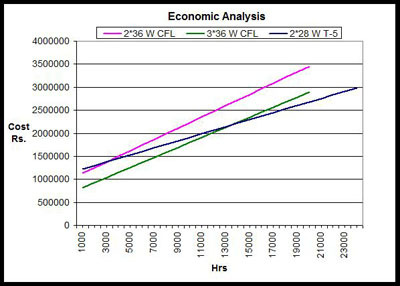 Given below is a case study which shows the economic analysis for a lighting scheme designed for a residential 3-BHK apartment space by using important parameters such as lamp selection, control gear selection, placement of fixtures etc. in making a lighting scheme efficient. For each of the space first of all the area should be calculated. Area of each space should be multiplied by 7.5 (the recommended LPD value by ECBC for residences) to get the upper limit of lighting power density value as shown in the figure below. Considering the Living/Dining area as an example for lighting design, first of all the location and source selection plays an important role in design. 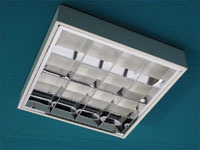 On longer facades we can install the linear lighting sources, while on the ceiling recessed point sources can be installed. After freezing the design, in terms of location and type of sources, we can advance to the lamp and gear selection process. 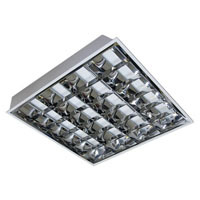 Considering the Option 1, as shown in the figure, the linear lighting sources are 40 W T12 FTLs with magnetic ballasts and point sources, and 60W incandescent lamps. The lighting load in Option 1 for the space comes out to be 400 W, which is higher than the upper limit value of 390 W for the space; hence the lighting scheme for the option 1 is an inefficient one. 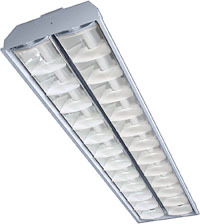 Now, for Option 2, as shown in the figure, the linear lighting sources are 28 W T5 FTLs with electronic ballasts and point sources, and 15 W CFLs with electronic ballast. Remarks: The lighting load in Option 2 for the space comes out to be 165 W, only which is quite low than the upper limit value of 390 W; hence the lighting scheme in Option 2 is an efficient one.